Today's card is made using the Cricut Art Philosophy Bundle from Close to my Heart. 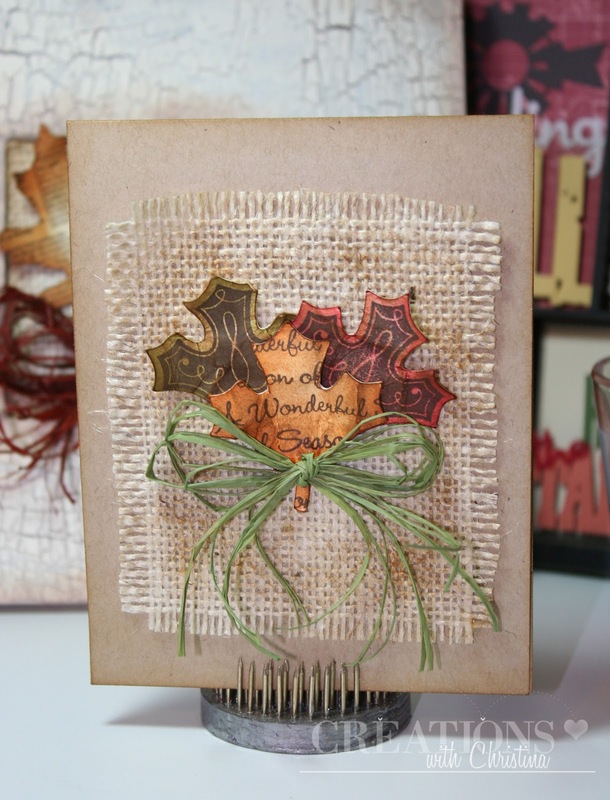 The card is inspired by a home decor item I saw in a magazine a few weeks ago. I've also been following along on with Jennifer McGuire's Inspiration showcase class and had to pull out my distress inks. Here's a video for you to enjoy. Hope you have a great day and see you back here Friday for Stampin' On Friday. I have a video ready for that too. love your use of the different elements you blended them together so perfectly. Beautiful! Thank you for the time you devote to these videos. I look forward to them!! I love this card! Thanks so much for the instructional video. Really, really nice Christina!! I love this look and the details make such a difference. I like using the burlap and the crinkle of the leaves. Great job! Love this card! It's cloudy and cold here today. Makes me want to go make one of these cards...lol!! Thanks for sharing! That is so very cool..love the fabric! Nice one for sure! Cool and not an ordinary-style card. Perfect for Fall!! I have to get going with my AP cart and start making these Fall leaves--so much on this cart and love that you are showing us a lot of ideas. Perfect fall card. I love the burlap idea. The whole card looks like it came from the farm! Just beautiful, love all of the elements you used, especially the inking. Did you use the StazOn because of the extra inking you did? I don't usually see you use that unless you are using your Copics. Just curious. Thanks for all of the great tips and inspiration. How pretty! Love that you showed this leaf cut....motivates me to try it too! love it.. what a beautiful card.. So beautiful. Love the stamped leaves. ayour inking gives them so much life. Great technique video, this information is gonna come in so handy. I love the card very unique. You ideas and designs give me lots of inspiration. Ive shared your blog with my sister who has just bought her first cricut. thanks for sharing your talent. Wow super I love it i have this cartridge and its awesome! Thanks for sharing!